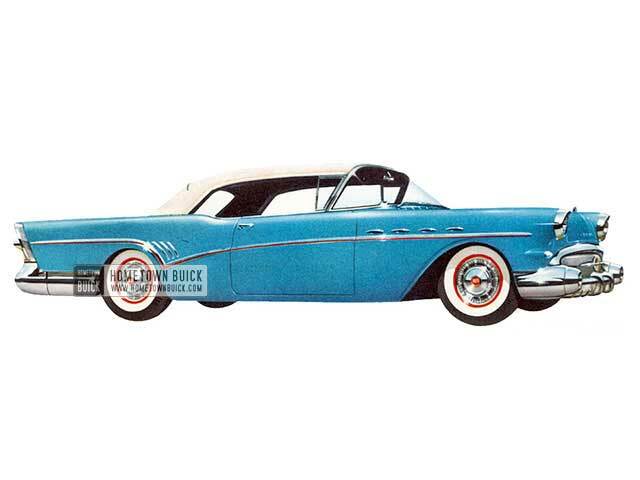 When you see the newest of two-door hardtops, Roadmaster, Model 76A, you'll see why Buick's stylists are so proud of this one. Interiors, are the finest that can be made. Bearing the same ‘dream car’ styling found throughout the line, the 76A combines its new two door appeal with the greatest power plant in Buick's history. 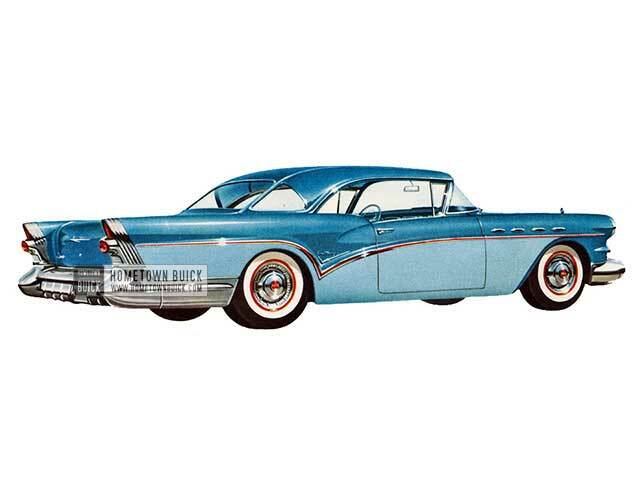 From the side, you can see what the new two-door concept has done to create a new open-air styling in the 1957 Buick Roadmaster Riviera - Model 76R. From within, passengers have more all-around visibility than ever before. There's an old saying: You haven't lived until you do. 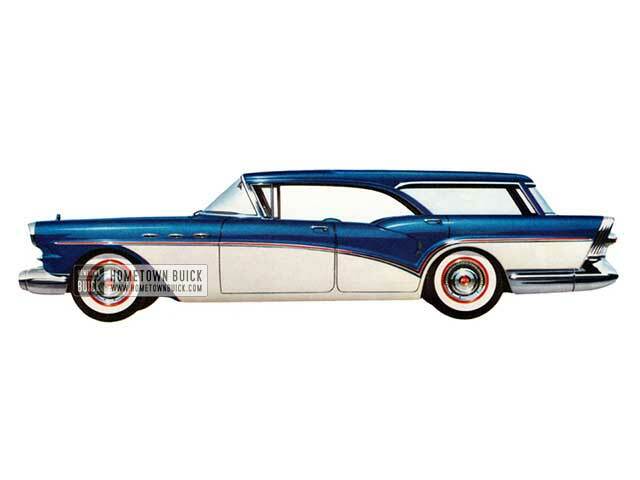 Buick's got the fines t selection you'll find anywhere in 1957. 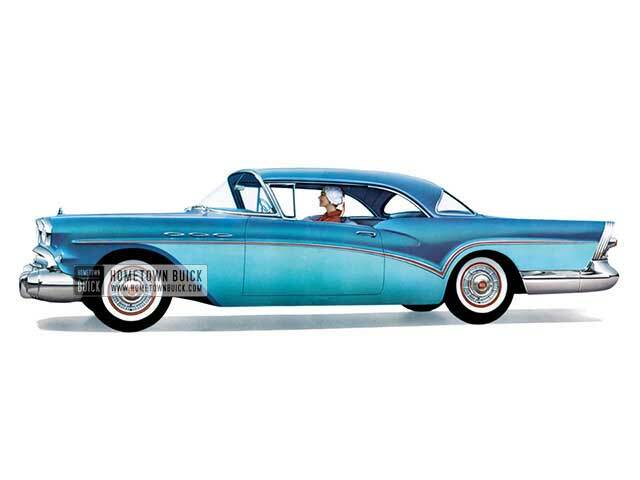 Take the 1957 Buick Roadmaster Convertible - Model 76C. Talk about outdoor living for the young in heart - here it is. Luxury marks this open-air beauty from the ground up. Tills is a real ground bugger that 's built with panther-like grace. In fact, the grace is p art of the body - part of the stout new '57 chassis that enables this year's line to be the smartest on the road. And power - well, you have the answer in a 364-cubicinch engine that produces 300 horsepower. To convert this power into action, there's the newest Variable Pitch Dynaflow-that most responsive of all transmissions that translates toe pressure into smooth, instantaneous action. When you want to go, you do. 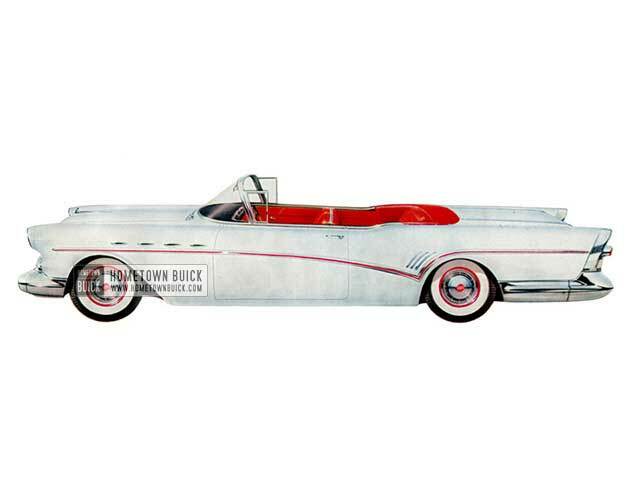 Long before these graceful new Buicks were delivered to our dealers' showrooms, rumor had it there were changes aplenty coming for 1957. 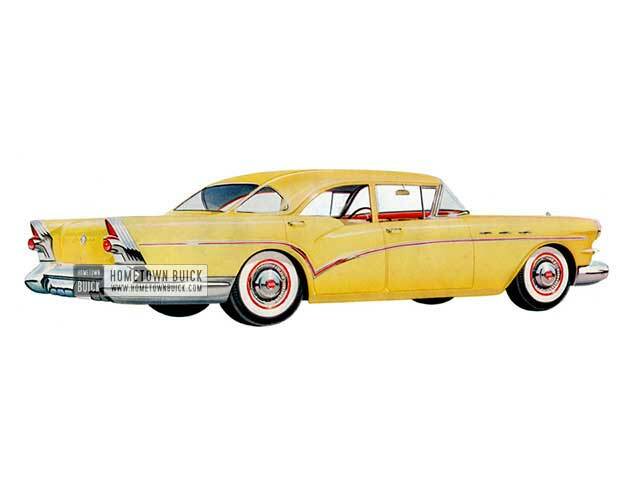 It's the newest in looks-as you can see in every gleaming inch of its low-sweep silhouette of the 1957 Buick Roadmaster Riviera - Model 75R. 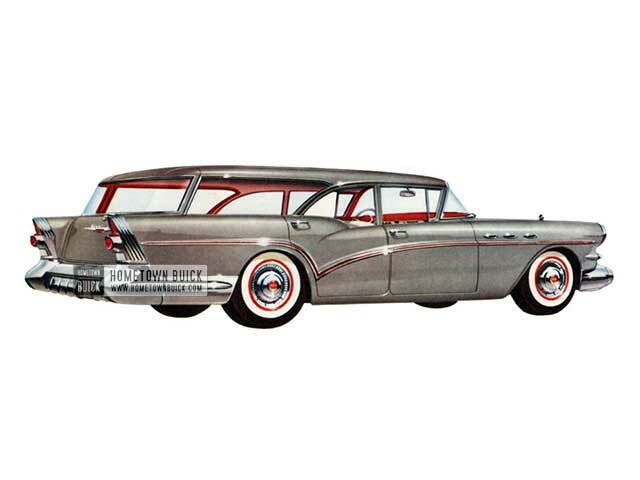 Here's the newest of all Estate Wagons - the 1957 Buick Century Estate Wagon (Model 69), known as the Caballero. In performance, the Caballero is as big and smooth as it looks. It delivers standard equipped with new Variable Pitch Dynaflow and the record new 300-horsepower high-compression V-8 engine. 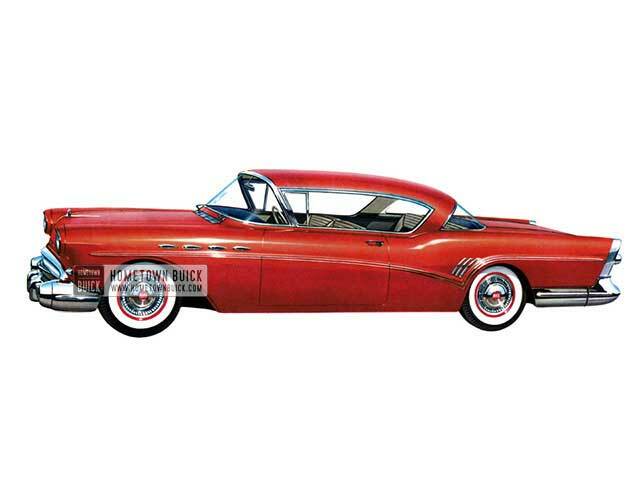 In the 1957 Buick Century Riviera (Model 66R), there's performance plus with beauty to match. Notice how the wider vision Panoramic windshield slopes smartly rearward. Two fashion-tapered lines flow across the roof to form a smart three-piece rear window. 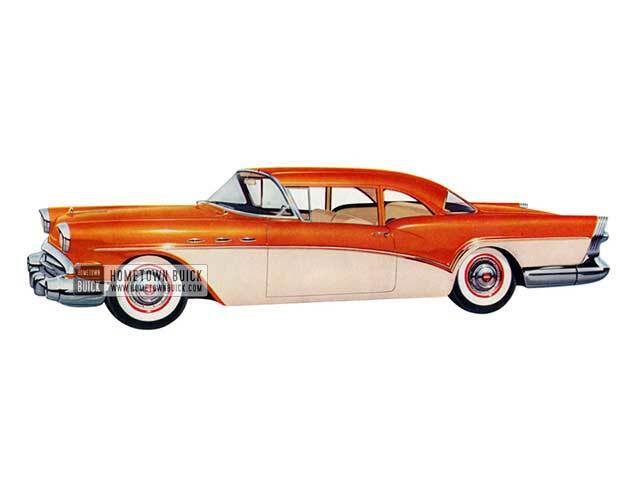 This model has new Variable Pitch Dynaflow as standard equipment, a wide choice of custom-quality standard trim, and a host of other 1957 motoring extras for your Century enjoyment. 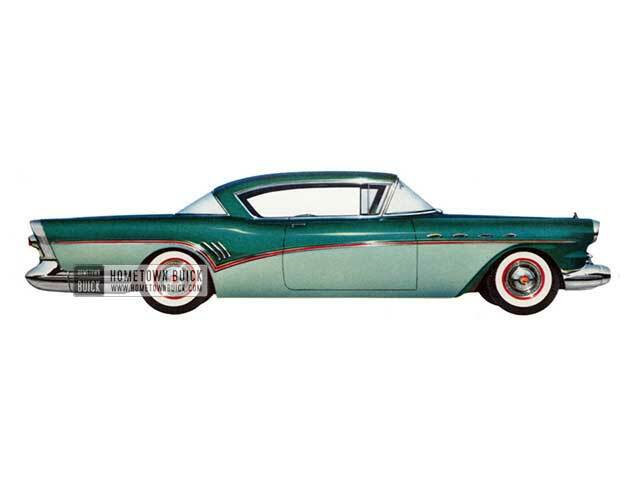 Hip high and looking yards longer, this snappy new 1957 Buick Century Convertible (Model 66C) is ready to travel. You get exciting new Convertible performance. And with Buick's new low-silhouette styling, you are in for new driving thrills in this action-packed Convertible. 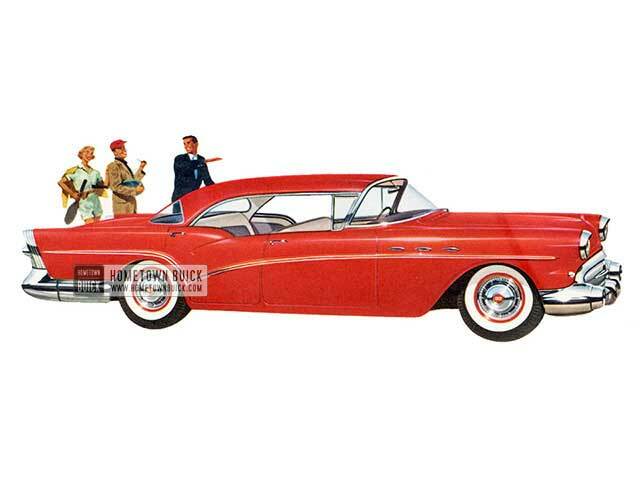 Leader of the four-door line is this graceful 1957 Buick Roadmaster Riviera Sedan (Model 73). You will readily recognize its distinctive treatment - divided rear window and chrome roof molding. 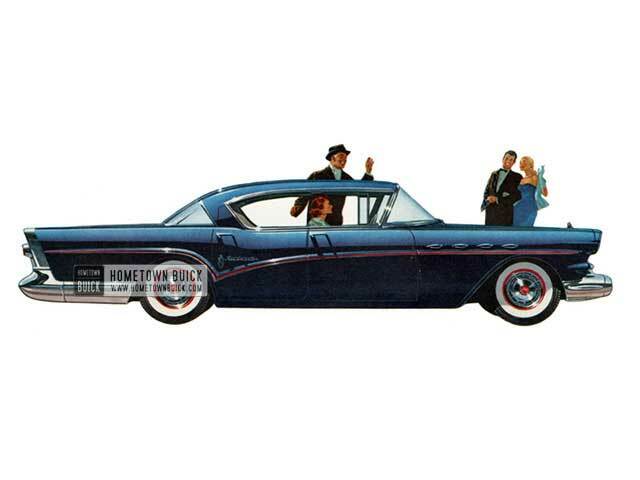 And you will enjoy all of Buicks greatest advancements for 1957 - new levelized Braking, new Safety Power Steering, convenient power window lifts, and many other exciting new features. 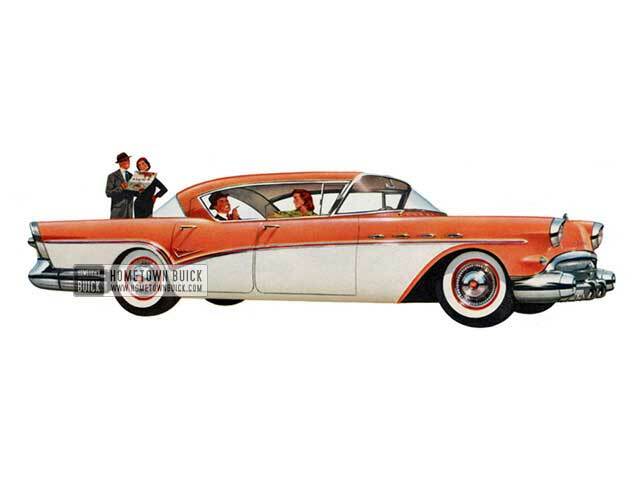 Now there's a new model in the Buick line, the 1957 Buick Century Sedan (Model 61). Like the rest of the Century Series, this model has a 122-inch wheelbase, 300 horsepower and a 10.0 to 1 compression ratio. With its dramatic new styling and slimmed-down center door posts, this newest Buick offers its owner the hardtop look with big sedan roominess. And even though it is the lowest priced Century, it brings all of the Century extras at no extra cost- the sparkling performance of a new Variable Pitch Dynaflow, the rich custom look in interiors, plus the Century's easy handling, luxury ride and a host of safety and convenience features. 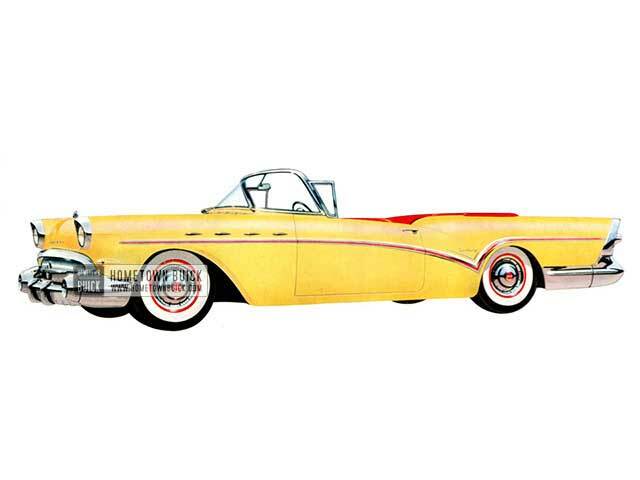 The 1957 Buick Super Convertible (Model 56C) truly represents an outstanding value in zestful motoring adventure. Smart, new, low-slung beauty, tremendous performance and the most complete equipment of any convertible in its price range, here is Buick's big-car competitor in the medium price market. Standard trim comes in four beautiful all-Cordaveen combinations. Power window lifts and two-way power front seat adjustment, as well as Safety Power Steering, Instant Variable Pitch Dynaflow, carpeted floors and many other items, are standard equipment. 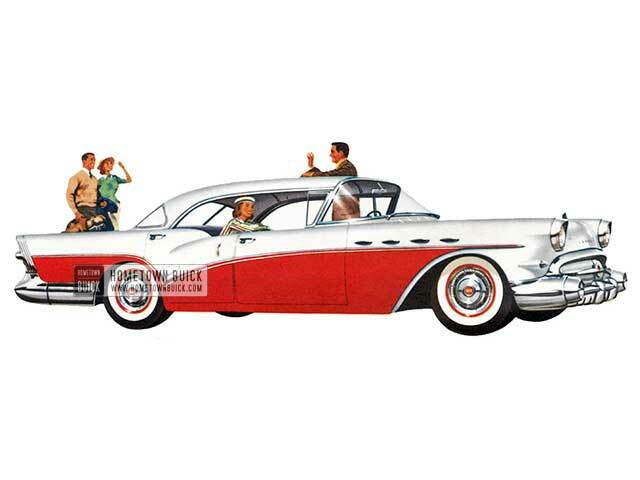 The 1957 Buick Super Riviera (Model 56R), brings a host of extras not found in any other car in the middle price range. It's low when you stand beside it, yet has ample room when you sit inside. 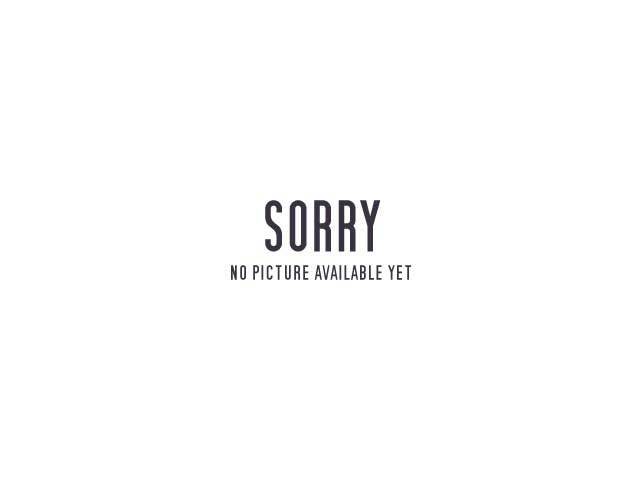 Smart new look. Smooth new ride and handling. The 1957 Buick Special Riviera Estate Wagon (Model 49D) combines the most popular features of the year- low-silhouette styling, Riviera design, Estate Wagon practicality, and big V-8 performance. 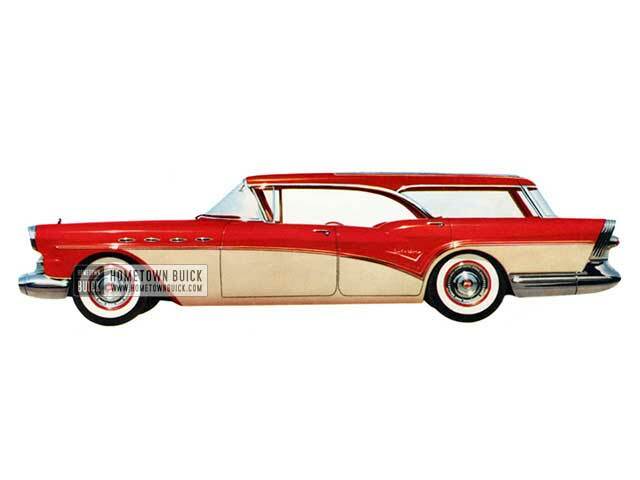 You can't tell by its smart new looks, but here is Buick's lowest priced 1957 Buick Special Estate Wagon (Model 49). You have a wider choice than ever of colorful new interior trims, plus many other interior options. Along with this, there is 250 horsepower with the option of Variable Pitch Dynaflow at modest extra cost. Buick's roomy new Estate Wagons are built for practicality as well as comfort and beauty. Fold the rear seats down and you have a long, level 101.9 inches of cargo space. 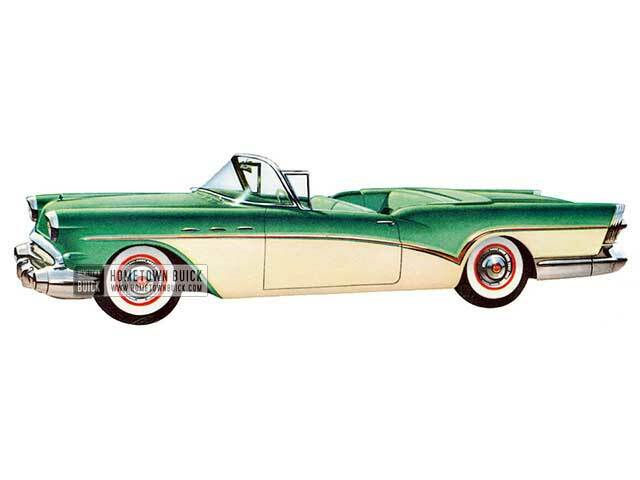 For sheer thrill in convertible driving, here's the low-swept 1957 Buick Special Convertible (Model 46C) combining snappiest styling with great new Buick performance. Adding still further to its new smartness is a wide selection of bright, all-Cordaveen interior trims with lops in colors to match. 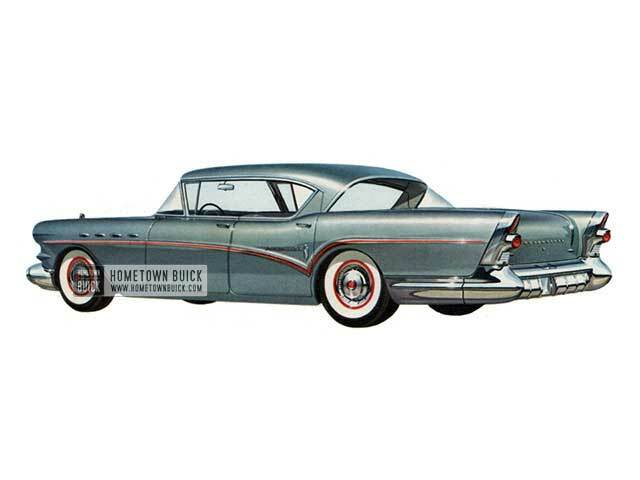 King of the road in value, Buick's 1957 Buick Special 2-door Sedan (Model 48), brings you the cream of Buick's big car features - power, roominess, performance, and new Low Sweep styling. Fresh, new styling brings forth new beauty in this fair Special -and at prices that will take your breath. 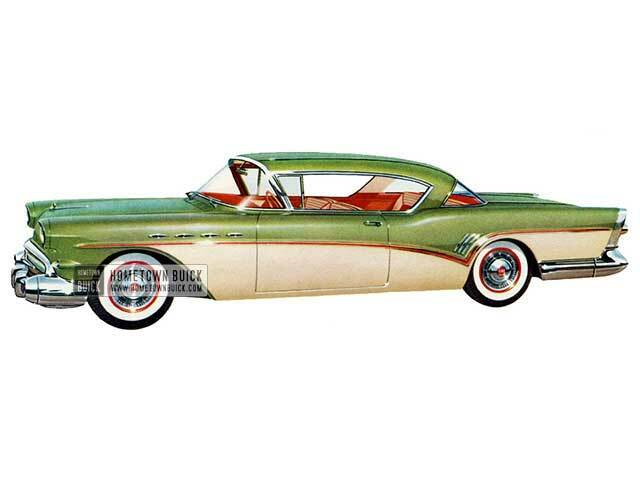 Buick's 1957 Buick Special Riviera Sedan (Model 43), brings to you smart, low silhouette styling, with four-door sedan roominess. 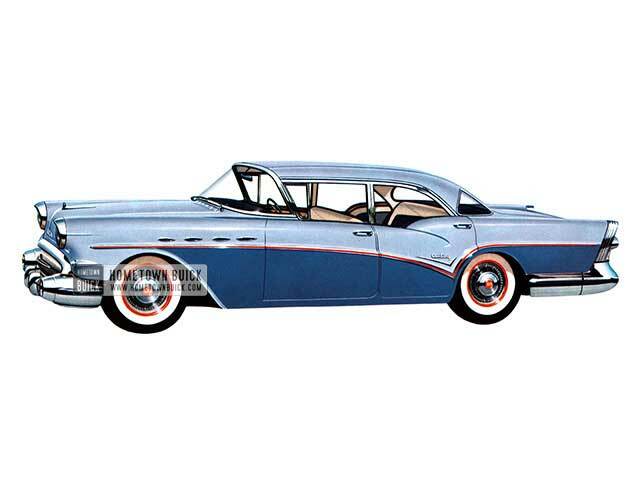 Buick's new 1957 Buick Special Sedan (Model 41) achieves new sedan beauty. Smart roof moldings, flowing across the rear deck, and completely new front end styling create a smart new fore and aft distinctiveness.